The legacy of the Wii continues, with Nintendo of America today announcing New Super Bros. Wii has sold ten million copies across the US since it was released in 2009. 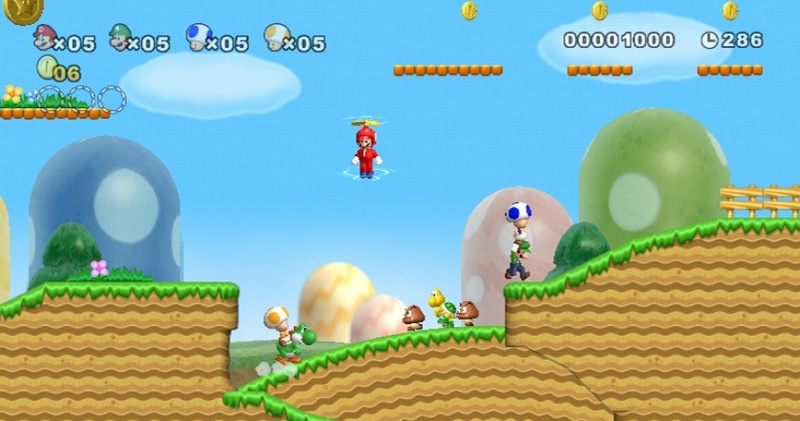 On release, New Super Mario Bros. Wii was critically acclaimed and a commercial success. As of March 2014, the title has sold 28.65 million copies worldwide, making it the fourth best selling Wii game of all-time, and second highest selling title in the Mario Wii line behind, Mario Kart Wii. Nintendo also recently revealed Super Smash Bros. for 3DS became the tenth game in the current portable library to reach one million units sold within the US. These two milestones combined come as positive news for Nintendo during trying times with the Wii U. Celebrate with us in the comments below. Well good for you Nintendo. I bought a copy again last year. Such a great game to have in my collection. Isn't it a budget title now too? 10 mill is a lot of players, but its always amazes me how small the reach of video games is in terms of world population. ...Can we move on to the Wii U already? That's a lot of copies for a game that isn't very good. I eagerly await the release of your game, what's it called again? Wii games can still be bought brand new in the US? And this is why after 10 years of almost no 2D platformers at all, we've seen a flood of them in the last 5 years. I count 11 Nintendo developed 2D platformers since 2009, and only 3 3D platformers... two of which had almost 2D gameplay (3D World/3D Land). I'm happy Nintendo has had this success but as someone that loves 3D platformers and doesn't really like 2D ones, I wish they'd even it out a bit more, but like everyone else, they'll keep focusing on what sells. NSMBU vastly outselling 3D World is just going to compound it. I own the NSMB U, but not the Wii game. I don't like those Nintendo selects covers(nor the PS/Xbox alternatives), so I'm looking for the original release. For new releases I'm hoping 2016 will be the year of 3D platformers, because I'll be done with the 2D kind after the overkill of the last few years and 2015. Definitely not the worst game of all alternatives to have sold 10M copies. I could try to give it another go at some point, although I liked NSMBU far better. @Peach64 Please list the 11 2D platformers Nintendo has made since 2009. I can't remember 11 of them, I want to see if there's any I missed & rectify that, thanks! @WiiLovePeace Probably throw in the Donkey Kong, Kirby, and Yoshi games and you'll rack in the 2D platformers quick. It's pretty easy to come up with 11 titles seeing how Nintendo is the king of platformers. Honestly the N64 / Game Cube years were the golden age of 3D platformers. Nearly everything got 3D-ified. Some were better than others though. In other news, does anybody else find the article/headline a little misleading? "On release, New Super Mario Bros. Wii was critically acclaimed and a commercial success. As of March 2014, the title has sold 28.65 million copies, making it the fourth best selling Wii game of all-time, and second highest selling title in the Mario Wii line behind, Mario Kart Wii." So which is it? 10 million or 28 million? @StarDust4Ever ah yeah I forgot about the non-Mario franchises, I guess I have played all of the 11 platformers already then haha. & as the title says "New Super Mario Bros. Wii Hits 10 Million Sales Mark In The US" as in, 10 million sold in the US, 28.65 sold across the globe. The article is crystal clear! I got the NSMB Wii Select last June. They should release Pikmin1&2 Selects as well or port it on the Wii U. @OmegaStar - My first thought exactly. Wii U has been out for 2 years and they spend a tweet a week before BF promoting the Wii? They should at least promote that it's playable on Wii U. Wii U is only 4 characters. @Grumblevolcano - Are you kidding? The Wii games section is much bigger than the Wii U games section in Target. Probably every where. Guess this explains why Wal-mart is promoting the Wii Mini big front and center on it's website w/ the Wii U tiny on the side. Its the first of the 4 circles in case you get 1 of the other 3.
this actually surprises me.... I actually thought this happened a while ago.... but honestly.... who cares, many games hit 10 million sales. Why not focus on the new? @Grumblevolcano Yes, the Wii U can play Wii games, so people who never owned a Wii can play a backlog of games. But everyone should hurry before they take them out of stores and start costing $90+ online like GameCube games. This is amazing. No company can do what Nintendo does... 10 million copies single platform for this platformer. Wow. @shaneoh Lol indeed. I LOVE this game, and I'm sure most agree. I think New Super Mario outselling 3D World is not a huge travesty. 3D World has now sold well over 2-million, so well over 1/3 of Wii-U owners have bought it. New Super Mario games just have a better chance to sell more. I bought both but I personally enjoy the 2D games better. Also, someone like my 67-year-old father-in-law has bought New Super Mario U and loves it but he probably won't ever get 3D World. The 2D games just reach a larger range of gamers. In saying that, I definitely enjoyed 3D World and am eagerly waiting the next Mario Galaxy/64/Sunshine. And not just single platform, but just in the US (not North America as a whole). Awesome! Heh, evergreen Nintendo titles at it's finest. @StarDust4Ever Not really one figure is worldwide one is just the US. (Might mean the whole region or the literal United States). Only US? Then worldwide this game must be more than 40millions. Why does people still buy the Wii game? I mean if you couldn't get a very similar game on the Wii U, like if you want to play Skyward Sword or Twilight Princess it makes sense. But isn't the Mario platformers on the Wii U good enough to keep you from getting a Wii Mario platformer? Yeah, I know crazed fans think differently, but most people? 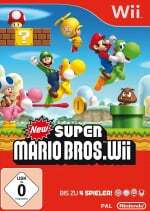 Super Mario Galaxy sounds like a special experience that you might not be able to get on the Wii U, but New Super Mario Bros. Wii? This is either incredibly bad news for the Wii U or New Super Mario Bros. Wii has to be a legendary experience. Wut. This is the most boring NSMB game I ever had to play. I would only buy this in order to play the infinitely superior Newer Super Mario Bros. Wii, which justifies buying this game. Huh, I didn't know they still sold copies of New Super Mario Bros. Wii. New Super Mario Bros. Wii is my favourite one out of all the "New Super Mario Bros." games, so it's nice to see how much it sold. They sold so many Wii systems--probably a respectable number in the last few years as well--that it's not really that surprising that there is still a demand for Wii games, especially big hits like that one. Everybody who had questions about 10 million vs. 28 million. A friendly suggestion: You may want to evaluate your reading comprehension skills. The article is very clear on this. One of the four biggest games on the Wii. Wii Sports was the phenomenon and the pack-in and its sequel sold more, but after that comes Mario Kart Wii and then New Super Mario Bros. Wii in sales. I like them well enough, but it felt pretty samey by the time the Wii U one came along. They do get interesting near the end stages though and I have plenty more to unlock if I get the itch again. 3D World is much more fun and innovative and I feel it's far closer to a 3D Mario than a 2D one. It's really a much more ideal to play with mulptiple players, too. Nothing seems to sell like the old-school-looking ones, though. This game doesn't deserve it, it's utter boredom. @shaneoh ouch nice burn. 10/10 would sting again. @KillScottKill Why do you include all 'fans'. I agree with your points there. NSMB series turned meh. It was nice to see the first one on the DS, but they turned like you said after this wii game came out. Also lol, who would say zelda gimmicky sword is the best zelda game ever? You will love NSMBU, it's wonderful. Man, business must be slow for Nintendo. Just kidding, just kidding. @Bolt_Strike not for those 10 million people there. Well, if we count the mod hack "Newer Super Mario Bros Wii", then this title is one of the greatest bang for buck 2D Mario titles! (128 extra levels) I doubt too many people know about it, but... It's a free DLC type addon so why not! I get the criticisms people had for it (Game Grumps critiques come to mind), but this was the first Mario platformer title that allowed 4 players simultaneously, which is something I would have loved to have as a kid! It used to be all about hotseat mode back in the 90s! Remember that, everyone? Back when we had to sit and watch someone else play more than half the time to share turns in groups of 3 or more people? I remember, it SUCKED. Don't let nostalgia blind you. If nothing else, this game at least got that weight of not having it available out of the way.